A typical day in the field usually goes something like this: The group wakes up about 8 a.m. and clients prepare their own breakfast. After breakfast, the group begins tearing down the camp. Once camp is broken, hiking begins. On a typical day, clients hike an average of three to five miles. The group itself determines how far, or even if they will hike. When the group has reached it’s destination for the day, clients begin setting up camp which includes making a fire pit, digging a latrine and gathering wood. Clients sleep outdoors most nights. Field guides show clients how to build a shelter in case the weather is bad. After camp is ready and before bed, clients usually have some free time to work on a value-driven curriculum we called phase work. Weeks at Medicine Wheel run Wednesday to Wednesday. The week begins and ends at Outpost – our unique in-field staging area. At Outpost, Medicine Wheel clients can rest and restock. There are hot showers, fresh water, and yurts for sleeping. Groups use this time to plan their agenda for the coming week and restock their provisions. The group decides where they want to be dropped off in the field and which path they will take to return. The expectation is that each group will hike back to Outpost to rest and re-supply by the end of the week. 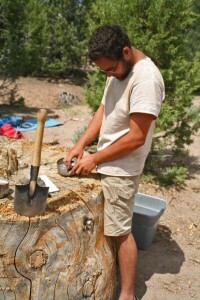 Shift change also takes place at Outpost each Wednesday when new guides replace the current field guides. While at Outpost, each group also participates in a community service project such as trail restoration or some other kind of camp improvement.